Todd Redmond talked with his mother before taking the mound on Friday, a typical pregame move by the Braves farmhand. "She told me, 'It was your grandfather's birthday today, he's passed away. Do it for him,'" Redmond said. "I said OK. And sure enough, it happened." 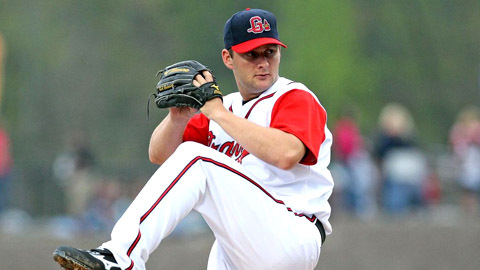 Redmond's next phone call to his mother was met by screams of joy after he pitched the first no-hitter in Gwinnett history and led the Braves to a 4-0 blanking of the Louisville Bats. "She didn't say anything, she was just basically screaming into the phone," Redmond said. "My mom's an unbelievable woman. I love her to death." Redmond, who threw his hands in the air before being mobbed by his teammates near the mound, pitched Gwinnett's first no-hitter exactly a month after his teammates were held hitless. It was the seventh no-hitter in the Minor Leagues this season and the second in the International League. "My mom called me, my dad, my agent, everybody," Redmond said. "I had friends back home texting me, 'Great job!' My mom was real happy for me." And what mother wouldn't be proud? The 25-year-old struck out three and allowed only two baserunners, both walks in the sixth inning, to record his fourth win. He threw 66 of 105 pitches for strikes, earning his first victory since April 30. "I felt great," he said. "I was throwing strikes and challenging the hitters. And I had unbelievable defense." The no-hitter came a month after Norfolk's Chris Tillman pitched one at Gwinnett. "It's unbelievable to be a part of and to be a part of two and be one of the persons that threw it, it's an unbelievable feeling," Redmond said. Redmond lowered his ERA from 5.70 to 4.79, benefiting from a few defensive gems along the way. "Matt Young made two really good plays in left, one against the wall, and [Jordan] Schafer made a great play in the first, running down a ball from Chris Burke," he said. Redmond had thrown only 72 pitches over seven innings but was tested by Chris Valaika during a marathon at-bat in the eighth. The Florida native, who'd never thrown a complete game in 129 career starts, finally fanned Valaika on a check swing for his second strikeout of the night, ending a 12-pitch battle. "I was telling the guys in the locker room, 'That was my first complete game in pro ball,'" he said. "To have a complete game and no-hitter, I couldn't ask for anything else." Corky Miller, who broke up a no-hit bid by Scranton/Wilkes-Barre's Jason Hirsh after 7 2/3 innings on April 27, led off the ninth and ripped a comebacker that Redmond kicked to shortstop Brandon Hicks, who threw to first for the out. "I knew I had it going and then the first hitter in the ninth, he hit off my foot and it bounced straight over to Hicksie," Redmond said. "I thought, 'Well, this is possibly going to happen. Any other thing that could possibly go right is going right.'" Redmond retired Michael Griffin on a fly ball to deep right, then struck out Louisville native and former Gwinnett teammate Chris Burke to set off the wild celebration on the mound. "I didn't hear the umpire, but then I was like OK. I just threw my hands up in the air when I saw the ump call it," Redmond said. "Everyone came out and jumped on me. I couldn't ask for anything else [than] to strike him out, it was a great feeling." Redmond finished with only three strikeouts, inducing 15 fly balls and eight grounders. He retired the side in order eight times. "I was happy with just three [strikeouts]," he said. "I felt like I was more under control that my last couple outings. I was able to actually create angle and just keep the ball down more than I have been. These guys were swinging at early pitches and I was throwing strikes. They were swinging at pitches and wouldn't allow me to strike them out." Selected by the Pirates in the 39th round of the 2004 Draft, Redmond walked Miller and Burke in the sixth but picked off Miller to end the inning and did not allow another baserunner. It was the first no-hitter in Louisville Slugger Field history and the first by a member of the Braves' Triple-A affiliate since Charlie Puleo and Steve Ziem combined on one for Richmond on June 27, 1989. Redmond will have plenty to talk about with his parents over the holiday weekend. "They were listening on the TV or Gameday. They listen to every game on the radio; my dad likes to keep track of my pitches," he said. "And my mom always gives me some encouraging things before I go out there, so it's always nice. Today was great." Danny Wild is an reporter for MLB.com. This story was not subject to the approval of the National Association of Professional Baseball Leagues or its clubs.